The Douay-Rheims Bible is oldest Catholic Bible translation in English. It was translated from Latin Vulgate and published in 1582 (New Testament) and in 1609-1610 (Old Testament) and revised by Bishop Richard Challoner in 1752. Bible in its present form is the Challoner revision. Translators used the literal “word for word” translation. That means Douay-Rheims Bible is a most accurate Catholic English Bible and a good source for Bible study. It has been in use for over 250 years and for the most Catholics is still the best translation of the Sacred Scripture in English. The Douay-Rheims bible is a good chose if you love English language, history, and tradition. For you who are looking for The Douay-Rheims Bible, I have reviewed a different variety of forms. These are my top choice among online offering. The Douay Rheims Bible is the only edition available with the words of Jesus in red. The edition contains annotations, references and a historical and chronological index. It is suitable for personal study as well as meditation. Includes updated color New Testament maps, beautiful pictures portraying the life of Jesus Christ. Complete with the Family record and Presentation pages. 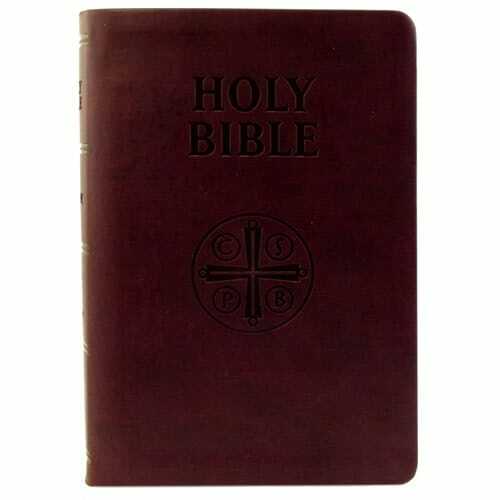 This Bible is available in a durable burgundy leather-soft cover, with gold edges and a ribbon marker. This beautiful Holy Bible is filled with the Glory of God’s Word. Even though it is not large print, it is still large enough print for most to read with ease. Bound well, it lays flat. Will easily fit into a medium-sized handbag or suitcase/briefcase. The Haydock Bible is a larger-print (12 points) format Douay-Rheims Catholic Bible. A comprehensive commentary uses 210 different sources. Mostly from the Fathers and Doctors of the Church. If you want to better understand the Bible, the Haydock’s Douay- Rheims Catholic Bible is the best Bible available. Illustrated Catholic Bible Dictionary and History of the Books of Holy Scripture reproduced from the 1859 edition of Fr. Haydock is included in the edition. In the book, there are engravings, beautiful illustrations, space for recording family births, marriages, and deaths. So the Bible is a perfect gift for Confirmation, Wedding or other gifts. The edition also contains Bible Dictionary, Historical and Chronological Index, History of the Books of the Catholic Bible and different tables. All make it convenient for deep personal Bible study. This Douay-Rheims edition is one hardcover volume on fine Bible paper with a gold-leaf image on the burgundy leather cover along with a satin ribbon marker. This hardback copy of Douay-Rheims Bible with black bonded leather is beautiful enough to be your family Bible. In addition to the classic translation of the Douay-Rheims Bible, this Bible also contains the encyclical from Pope Leo XIII on the study of the Holy Bible. Apart to sharp, readable text, you can find also printed end sheets, two marking ribbons (in gold and red satin), maps, an index, 32 classic woodcut illustrations and family register pages. The Latin Vulgate in the edition of Pope Clement VII (Clementina Vulgata) was proclaimed the official Latin Bible of the Roman Catholic Church after the Reformation. Having both Bibles (Latin and English) side by side allows you to see exactly where the vernacular translation comes from. Even those with limited Latin skills will be able to follow along, using the Douay-Rheims translation as an aid. The result is a beautiful, captivating read. The cover and spine are nicely ornate, fitting this August and historical edition of the Bible. When you hold this edition, you just have the feeling that you are holding something quite unique and remarkable. It looks and feels sacred as if one is in possession of a liturgical book from a few centuries back. It’s a large book, as you would expect for what is effectively two complete Bibles. It is very nice looking, inside and out. The print is a reasonable size in a nice font, and the paper appears fairly high quality, though it is as thin as you might expect. The two-column English and Latin format is surprisingly accessible providing quickly associated familiarity with little understanding of the Latin text. Bound in leather with ornate gold blocked cover and spine. Gilded page edges, head and tail bands and two satin ribbons. Now, THIS is a beautiful bible! This is what a holy bible should look like. Simply stunning. No one can look at this bible and not be in awe at how beautiful it is. 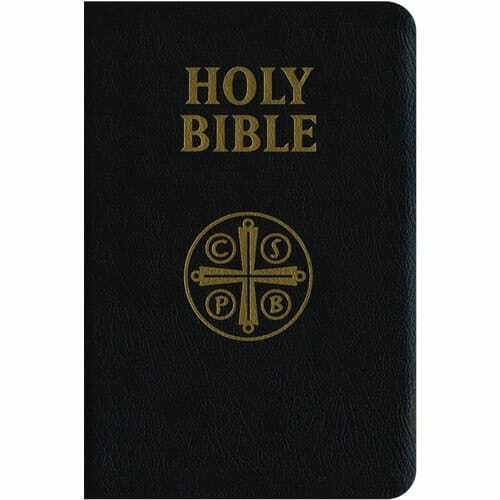 This pocket-size edition is 6-7/8″ tall and complete of old-style engravings showing the Bible stories. The edition also contains the three Papal Encyclicals on Holy Scripture, Preface of Providentissimus Deus by Pope Leo XIII, Spiritus Paraclitus by Pope Benedict XV, and Divino Afflante Spiritu by Pope Pius XII. It has two ribbon placeholders. The written text is in two columns per page. A font is a bit small but crisp and clear. The size is perfect to carry around and travel with. with me most of the time…rather than reading depressing newspapers in the coffee shop the book of wisdom lifts my spirit or the psalms lightens the troubles of the day. Thank you for the excellent service. This is a 10 star edition!